Refinishing and Reengineering existing furniture pieces prevents hundreds of valuable assets from being sent to the landfills. “Three R’s” of Protecting and preserving the Environment: Reduce, Reuse, Recycle. The objective of “Reduction” is to save consumers and businesses money in reduction of the overall amount of new goods they purchase and consume. You might be surprised at the amount of energy and natural resource expended in manufacturing, packaging, and shipping new furniture. 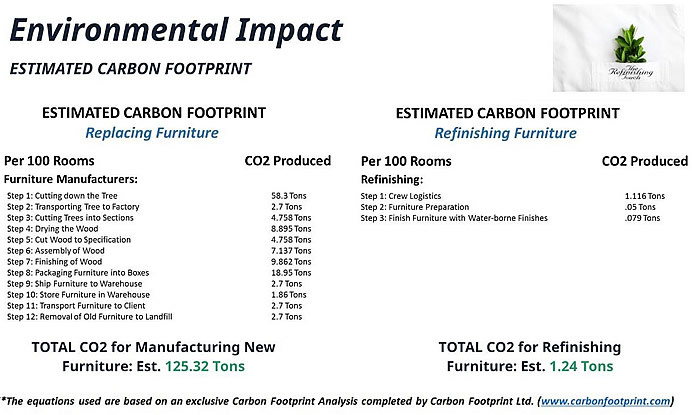 You can use our customized Carbon Footprint Calculator to estimate what the hidden environmental costs of new furniture might be, but even that doesn’t capture the whole picture! What about the old furniture you would have to dispose of? New furniture created today will not be made from solid wood. Even if you are shopping environmentally responsibly and purchase sustainable furniture, the lifespan of the furniture is still going to be roughly one-third of the amount of wear and tear a solid wood piece of furniture could be expected to last. This means that in less time than the new goods can be depreciated (Federal tax laws estimate about 7 years) they will need to be replaced. With solid wood furniture, many companies have extended the useful life for as many as three times their amortized lives. With refinishing, you can get another twenty years out of those sturdy, durable pieces. Keeping your original furniture in use and out of the landfill for another twenty years. Most of the pieces of furniture you’ve got will be reused with a refinishing project, but what about the pieces that are outdated, such as bulky television armoires? As the television signal switches from analog to digital in 2009, most of the CRT televisions in use today will be outdated and unusable. With the new wide-screen, flat panel sets, that bulky TV armoire could be wasting space, if it weren’t also providing valuable drawer space or room for a minibar. Recycling is defined as “breaking something no longer usable down to make something new.” The Refinishing Touch does exactly that with your old TV Armoire. We reengineer and remanufacture the existing piece to make it work for another twenty years, customizing each armoire to ensure that it matches the rest of the suite of furniture in the room. The Refinishing Touch estimates a savings of approximately 2,250,000 lbs of wood from landfills nationwide since our inception in 1977. Reimagining furniture in ways that reinvents pieces to make them more functional, durable and unique is a cost effective tip for managing FF&E.